Installing insulation to copper water pipes. This week, we remind people that there are numerous checks that can be completed which can minimise the affects of bad weather. 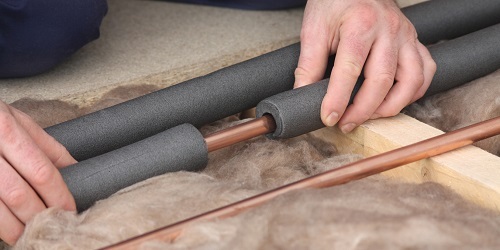 ● Insulate pipes and drain off outside taps to prevent frozen pipes. ● Know where your stop tap is and make sure you can turn it on and off with ease. ● If you are going away, consider asking a friend or neighbour to check on your house regularly. That way, if you have a burst, it will be discovered early. ● Leave your heating on if the weather is forecast to be freezing. ● Insulate your loft or walls to keep the heat in. Free and impartial advice about energy saving measures, grants and discounts is available from the Save Energy Advice Line on 0800 043 0151. ● Fit draught proofing to seal any gaps around doors and windows. ● Get your boiler serviced regularly by a qualified engineer. Remember, for gas boilers, check that your engineer is Gas Safe registered. Oil-fired heating needs servicing too. ● Be prepared for clearing ice and snow this winter – have a snow shovel, brush and grit or salt ready. ● If a member of your household is of a pensionable age, has a disability, is chronically sick, has hearing and/or visual difficulties or you have a child under eight years old, you may be eligible for free services. You can contact your energy supplier to check whether you are eligible for free or priority services. Suppliers have a duty of care to households with customers who may be vulnerable regarding their energy supply. ● Winter is also a good time to be aware of what to do if electricity supplies go off. Don’t assume that suppliers will know that power supplies are down – call them and have your name, postcode, house number and telephone number handy. ● Winter is also a good time to know what to do if you have a burst pipe. If you do, collect the water in a bucket and switch off your central heating. Turn off your stop tap and turn on your sink taps to drain your water system. Don’t touch wiring or switches which you suspect may have been affected. If in doubt, turn off your electricity at the mains and call a plumber. For more information, call 0845 746 2200 or visit the United Utilities website. ● Keep chimneys and flues clean and well maintained, ensure that embers are properly put out before you go to bed and always use a fire guard to protect against flying sparks. Councillor Liz Wardlaw, cabinet member for health, said: “We know that winter can be a daunting time of the year for some people but there is support out there for residents to access to help them stay warm, well and safe.